Google's Experimental Lab: Timeline generator! I admit it . . . I’m fascinated with mashups and what they can do. The potential for configuring data you want in the ways you want it is just too good to be true. But it IS true. You CAN get all sorts of data, mix it up, sort it, and then have it delivered to you the way you want it. 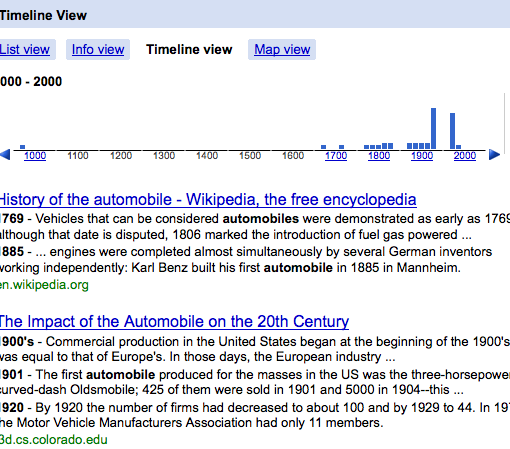 You will see a timeline of the history of the automobile, with data served up by Google’s search engine. You can see that the history starts in the 1700s. You can click any of the dates and a group of websites will appear that will provide more detailed information. Think of the possibilities for this automatic retrieval, sorting, and visual display of data! Students could research the history of just about anything on this automatic timeline generator. I haven’t done this yet, but you could experiment with the search terms and maybe search two different yet related concepts, having them generated through a timeline. It’s just a small example, but a powerful feature that Google’s search engine offers. I sure was excited to find out about it!